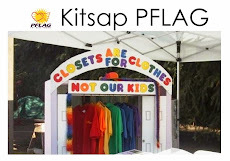 Our next Kitsap PFLAG meeting is Monday, February 16 at 6:30 p.m., Presidents Day. We welcome new members at all of our meetings and we'd love to hear back from anyone who has attended a meeting in the past as well. PFLAG works best when we keep in touch are make ourselves available to help those who are coming to their first meeting. As usual we are meeting at the Family of God Lutheran Church at the corner of Central Valley Road and Fairgrounds Road in East Bremerton.